These ARE the 'dog days' of summer. Baseball season is winding down and the playoffs loom just ahead. Fall seeds need to be ordered soon and planted. It's time to deal with the end of the summer produce and look into the cooler months ahead. 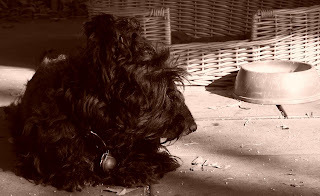 This is my faithful friend, Casey, also known as 'the Gardenmascot,' a proud Scottish Terrier who is in his waning days as well. Sorry this post got put up so late - it's been a jam-packed month. I've had a great crop of peppers this year – which, I find a tad disturbing, because this year was lousy for eggplants this year due to a lack of consistent heat, and if it didn't get hot enough for one, I'd think it'd not be hot enough for the other. But I have a lot of peppers. We pickled about 5 pints of the Sweet Banana peppers so far this year, but the jalapeños, I'm letting stay on the vine until they turn red so I can dry them until they are crispy to grind them into powder for a teentsy little zip in some recipes over the coming months. About half-way into the month, it usually becomes cool enough to sow arugula, beets, carrots, lettuce, peas and turnips. My leek and fennel seedlings ought to be ready to transplant out, as should broccoli, cabbage, Brussels sprouts, cauliflower, chard, endive, kohlrabi. As September wanes, probably the most productive time in the Southern California potager begins. If you are eating from your garden, now begins the time you can really feast for awhile, the last of summer – peppers, tomatoes, eggplants, okra, sweet corn, basil – is still out there to eat and the first root crops or lettuce will be big enough to munch a bite or two. I enjoy eating BLT sandwiches and for a brief moment in spring and another brief moment at this time. I make my own bread, so the tomato and lettuce come from my garden and the only parts I buy are the bacon and the mayo. It's almost a mystical experience for me, especially when the bread is still warm from the oven. Finish it off with a dessert of figs heated on the grill or in a broiler, drizzle honey on them and a dollop of some fairly stout Greek yogurt on them. Oh is that to die for! Not some store-bought fig shipped in from far away, but a fig that got ripe on a tree in the back yard or from a local farmer's tree that you found for sale in a farmers' market. Fava beans, lentils and peas are in season now, too. All of these grow best in our cooler winters. Fava beans were the only bean in the Old World before the Americas were discovered; all the other beans are American in origin (as are tomatoes, peppers, and potatoes among others – one wonders how in the world the Italians and French survived long enough to arrive at a culinary tradition!). Fava bean plants, as well as lentils and peas, make a marvelous addition to any soil building program and favas, when combined with artichoke hearts, make a Mediterranean stew so delicious that my taste buds flutter just to remember. To have sweet pea (Lathyrus odoratus) flowers for Christmas, they must be in the ground by the first weekend of September. Please note that 'sweet peas' refer to a flower, while peas (Pisum sativum) are a food plant. The sweet pea flower (which I think has the most divine aroma! ), is strictly an ornamental as the seeds are poisonous. Not smart to confuse the two – gives a whole new scenario to the “no TV for you until you eat your peas!” line. If you don't start your own seeds, find broccoli, cabbage, kale, chard and onion plants in a good nursery. Don't scrimp on your plants – if they have been cared for with indifference (like one might find at a big box store with minimum wage employees who may even hate working in a nursery) you might not get the quality plants that will produce the best (or the most) food. You are going to invest considerable time in growing these plants before they will be your dinner. Buying a cheap plant might be 'penny wise and pound foolish.' If you have to hoard some pennies, skip a couple cups of coffee rather than buy cheap plants. I think it's better to start your plants from seed, instructions are easily available, if you can, find the seminal seed starting book, The New Seed Starters' Handbook by Nancy Bubel. That was the book that started me on the road to starting almost all my plants from seed and is still the best book on the subject. I see if sells for about $14.00 on Amazon; I got my second copy (the first went a-wandering) from a close out bin in Borders for $3.00. Starting from seed, as you saw if you went to any of the web sites from last month, offers you the most diversity in what you have available to plant and you control over when you plant as well – which is a delightful way of keeping your garden looking its best. Mind you, this takes patience and time – but the rewards are equal to those investments. Isn't that the way of everything, though? This is an exciting time to be gardening. Grab your imagination and look at where you planting. Think about the eventual size of what you are planting – it's OK to make mistakes – that's how we learn! When I'm teaching a class, the truth of it is, I have probably killed more plants than anyone else in the room and yet, they are the ones saying “I have a black thumb.” That's probably not true at all. The big difference is when I kill a plant, I usually know why it died and sometimes it isn't my fault. And when it IS my fault, it's usually because I wasn't paying attention. Death by inattention isn't a 'black thumb' issue unless you do things like forget to turn your car off; or forget to go to work in the morning. Death by inattention is reformable – it's a changing of your patterns. Be good to yourself and it'll change. WifeyWu and moi used to grow many sweet banana peppers and make a wonderful tomato/pepper sauce.